Little Native Hockey League (Little NHL) tournament was started by five very special people who wanted to start a tournament for our First Nation Youth. 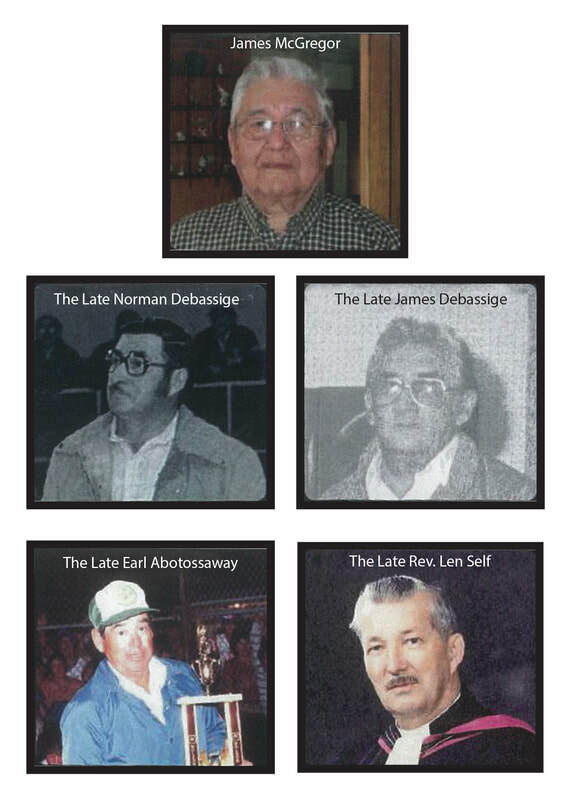 These people were Earl Abotossaway, former Chief Jim McGregor, the late James D. Debassige, the late Reverend Leonard Self and the late Norman Debassige. Their collective dreams became a reality when they held their first tournament during the Christmas break in 1971. It is a great honour for all to keep up the tradition of the Little NHL tournament started by these special individuals. The first tournament had 17 teams and a modest 200 players in Little Current. Today, in 2018, the tournament has grown to 209 teams and approximately 3000 players. The City of Mississauga is the host city of the Little NHL and will remain the host city until its’ 50th Anniversary in 2021. The tournament will host 519 games in 4 days on 15 ice surfaces out of the Hersey Centre, Iceland, Meadowvale, Tomken Arenas and newly added in 2018, is the Carmen Corbasson Community Centre and Arena. Many First Nation communities have hosted the tournament over the 44 year history. Some of these First Nations include Aundeck Omni Kaning, Curve Lake, Dokis, Fort William, Garden River, M’Chigeeng, Nipissing, Sagamok, Saugeen, Six Nations, Walpole Island, Wausauksing, Wikwemikong, Whitefish Lake and Whitefish River. Many of our former L’NHL’ers have gone on to various levels of Hockey excellence with “AA”, “AAA”, Tier II, Junior B, College/University, OHL and NHL level of play. The caliber of players gets better with each passing year, while the spirit and intent of the tournament created by the founders remains the same. The tradition continues today with the four pillars of Education, Citizenship, Sportsman and Respect. ​To allow our Ontario First Nation children an opportunity to play hockey and represent our Ontario First Nation communities. ​To lead, develop and promote a fun and positive hockey experience to provide our Ontario First Nation Youth an opportunity to be educated about the values of fair play and sportsmanship, both on and off the ice, including respect for all citizens attending the Little NHL. Mr. James “Jim” McGregor, a long time Chief of Whitefish River First Nation, has a great love of and passion for the game of hockey. It was only recently that he officially retired from the game. In those early years, along with equally skilled local team mates, Birch Island has produced and continues to excel in the game of hockey. He believed that not only was it a great sport, but that it also built upon personal character and strength. More that thirty-five years ago, he and a select group of local Manitoulin Island residents and Reverend Len Self were instrumental in helping organize the “Little NHL” an all aboriginal hockey week for youth in Ontario. At that time Jim was a great supporter of local hockey and was always instrumental in helping organize local community hockey and encouraging players and parents of the same. During those early years the Birch Island Hockey team had become renowned for their quality play and sportsmanship. In fact many of the initial practices and games were held on an outdoor ice surface much of our local hockey talent continues and grew out of those initial efforts. On numerous occasions, Jim has been recognized and awarded by Whitefish River First Nation and the “Little NHL” committee for his outstanding achievement and great contribution to the game and his community. Jim continues to be supportive of local minor hockey endeavours and is truly perceived as a local hockey icon. Earl “Shrug” Abotossaway was there in the beginning. 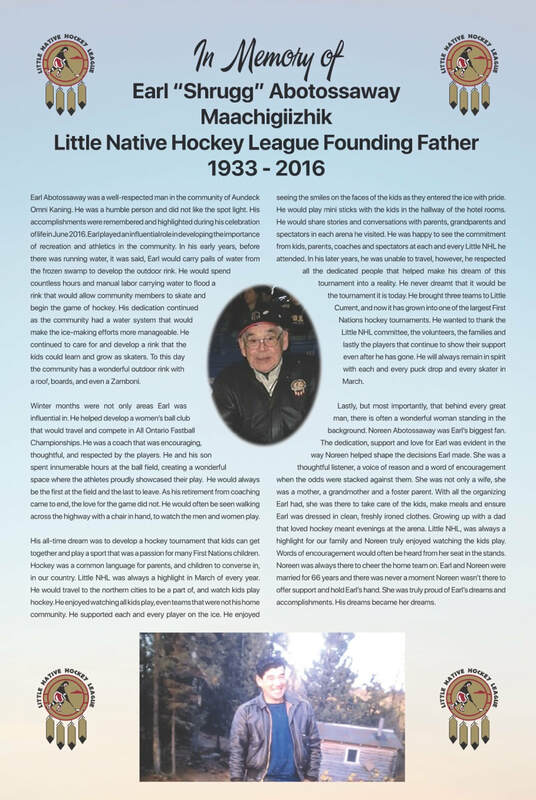 For over 30 years, Earl has maintained some connection to the Little NHL from the time he, Len Self and the other original founders from the Manitoulin Native communities conceived the idea to plan and implement a showcase fro First Nation children to play the game of Hockey. He has watched the tournament grow from an event that was predominately made up of local Manitoulin and North Shore teams to a tournament that includes teams from across the province of Ontario. The year of the first Little NHL tournament, Earl and his family were one of the many hosts who billeted teams from other First Nation communities and fondly recalls the little things that made his involvement worthwhile. He remembers thinking at that time that television would be the most fascinating item for the players from Moose Factory who he was billeting but discovered that their experience of seeing a horse for the first time was more interesting to them. Earl grew up playing hockey on ponds and flooded areas that iced over and it was these experiences that caused him to make every effort to ensure that the next generation of hockey players would have it better. Prior to the Little NHL he had become the “unofficial” caretaker of the outside rink and the Ball-Field in the community of Sucker Creek and still maintains an active role in these duties. His influence in the area of sports and recreation is reflected in the championships that the Ojibways of Sucker Creek have in Fastball, Hockey, Broomball, and many other sports. He organized, coached and managed teams that extended from boys hockey, seniors and old timers in the early years to include today’s women Fastball and Hockey teams. Earl still believes that the Little NHL tournament should be “educational and not just a get-together”. He recalls the original intent of the Little NHL was supposed to be educational in respect to the many different cultural aspects in addition to the recreational facet since children form many different communities, languages, lifestyles and backgrounds were gathering in the spirit of friendship to meet and get to know each other. Norman was a dedicated husband. A proud father. A Coach and a dedicated fan. He loved the game of hockey, you could always count on Norman being the number one fan at the games. In 1971, Norman put together the first Annual Little NHL tournament. Today the Little NHL is growing greater every year. Norman would be honoured knowing that the Little NHL is in his memory. The late James Debassige, a long time M’Chigeeng Chief, had a great love of and passion for the game of hockey. He believed that not only was it a great sport but that it was also a wonderful teaching tool. More that thirty-five years ago spurred on by some youth vandalism in the community he decided to do something about it. They began to revitalize the then West Bay Hockey system, they recruited coaches, players and parents; together they built what would become one of the most powerful minor hockey systems on Manitoulin and the North Shore. Many players grew out of the great efforts of jimmy and his organizational team. Jim was also instrumental in helping organize the Little NHL and was always a most solid supporter for this terrific event. In 1972 he was recognized by this group; being awarded the prestigious certificate of merit. About the same time Jim was the moving force behind the first summer hockey school, when he invited former NHL defence star Randy Carlyle to run a program at the new West Bay Arena. This program ran successfully for a good number of years, enhancing the level of hockey at M’Chigeeng and on the rest of Manitoulin. Jimmy felt at home in any arena and was a great friend to each and every hockey player. Hockey needs more Jim Debassige’s. “Giving” was Rev. Len’s way of life; he was a teacher, an education counsellor, a Minister. But always gave freely of his time, his knowledge and his philosophies. Habitually “Rev. Len” was a giving man never expecting anything from his fellow man. This philosophy allowed Len to succeed in all his endeavours. A graduate normal school, University of Western Ontario and Knox College at the University of Toronto, he was ordained as a Presbyterian Minister in 1943. For 50 years he served congregations in Norval Midland and the borough of East York in Metropolitan Toronto; Taught High School for 4 years in Barrie Penetanguishene and Camp Borden; was an education counsellor for the Department of Indian Affairs for 4 years (1970 to 1974); served as Reeve and Mayor of Midland for 7 years and was a member of the Board of Education for the borough of East York. In addition Rev. Len was the Chaplain to the Native Canadian Centre in Toronto, where he was often referred to as “Buzwa”- Man of the Spirit. As a Minister “Rev. Len” always involved himself in sports for young people, whether they went to church or not, he always felt strongly that sports is simply a way to teach lessons in living. He believed in education through recreation. His philosophy for any sports league he helped organize was simply based on participation rather than competition, this was the cornerstone for the Little NHL founded by the late Gordon Alcott in Georgetown, which “Rev. Len” helped organize in 1936. “Rev. Len” had a vision for this tournament and we are all living the dream. We thank you and we honour you.